I accidentally skipped my post in the Brands I Love series for the month of September, so this month, I am giving you 2 blog posts dedicated to 1 brand I love! Free People definitely deserves more than one blog post. I can confidently say that it is my favorite brand for sweaters and fall tops. Today I'm sharing my very favorite top by Free People and some of my favorite dresses. Tomorrow I will be back to share the rest of my Free People tops and sweaters. 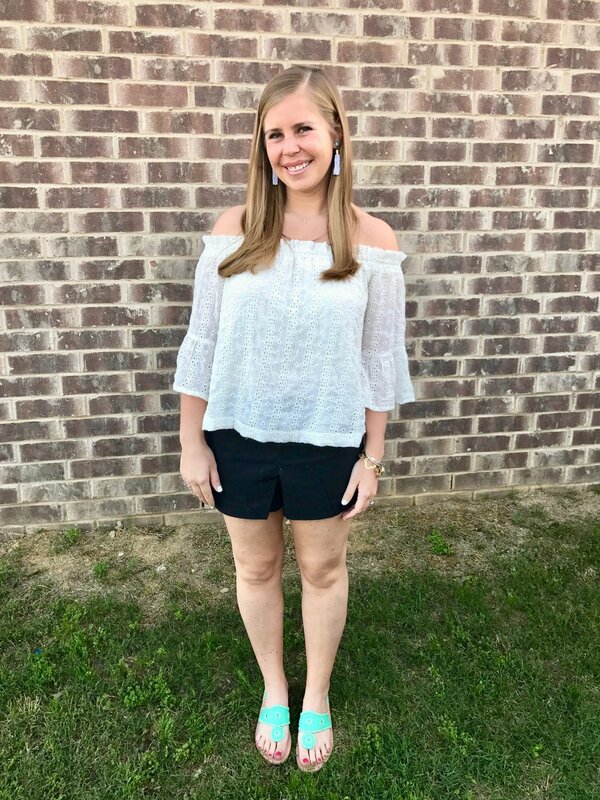 My Favorite Free People Top- If you have read my blog posts over the past couple of months, you have probably seen this top 10 times. 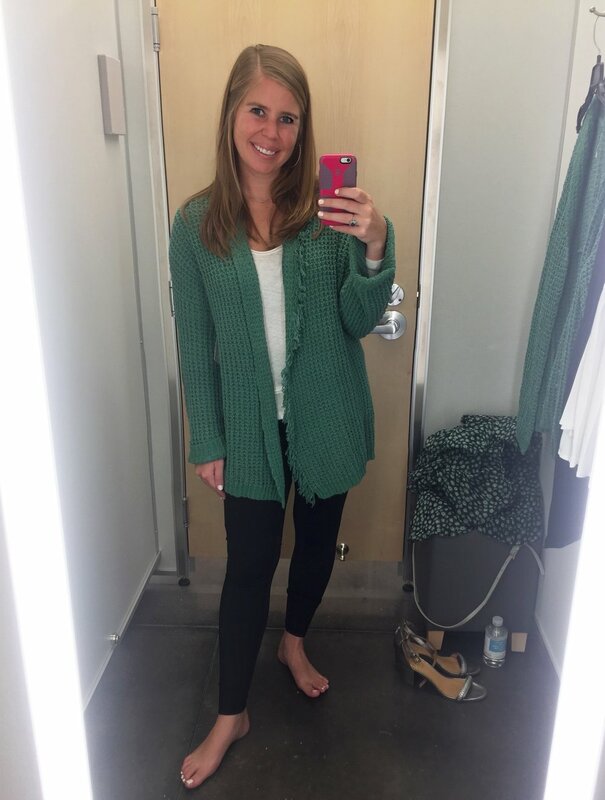 It is called a thermal tee and is the perfect lightweight sweater material, which makes it perfect to wear in the fall and winter months down south. You can see in the photo above that it is a very versatile top and can be styled in various ways! I have the mint and also want the beige. My mom and Ebie have the mint and beige ones. My mother in law has 2 of them. One of her best friends got one. My Tridelt house mother has one. It's such a great top y'all! I did size down to a small because Free People typically does run on the larger side. However, I think this top is supposed to have an oversized fit anyway. 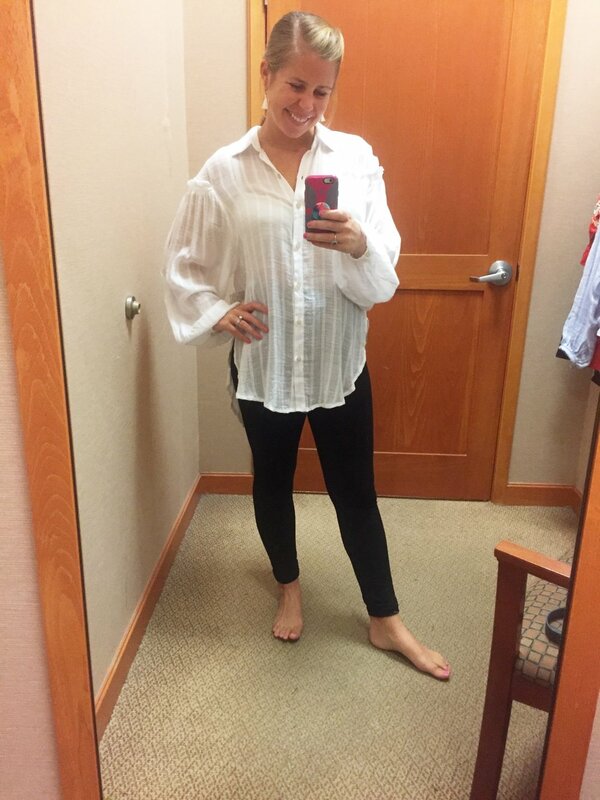 The length makes it the perfect top to wear with leggings or skinny jeans and boots AKA my fall uniform! Perfectly Victorian Dress- Free People has brought this dress back several years in a row now because it does so well and sells out every year! I have it in mustard and my mom has it in blue. These exact colors are no longer available. However, I LOVE the black and pink ones that are available. The dress is so fun that all you have to do is throw on a cute pair of shoes and some simple accessories, and you've got the cutest outfit! Embroidered Minidress- How pretty is this dress? I love the bright lilac color and the embroidery. If lilac is not your thing, it comes in 5 other colors and is one of those dresses that you will be so happy to have in your closet! So easy to throw on with a pair of booties now and a pair of leggings and boots later on (if it ever actually cools down). Off the Shoulder Shift Dress- If I were still in college, I know I would have had this dress in red (even though it is not Alabama red) for gameday! However, now that I am out of college, I think I would get a lot more wear out of the black one. It comes in 4 colors and is so cute and fun! Neutral Striped Dress- This was one of my favorite dresses of the summer! I love the neutral stripes, sleeves, and length. You can now get it on sale! I also got it in the other color way because I thought it was such a cute dress. Magic Mystery Tunic- I actually got this last fall, but they brought it back again this year! 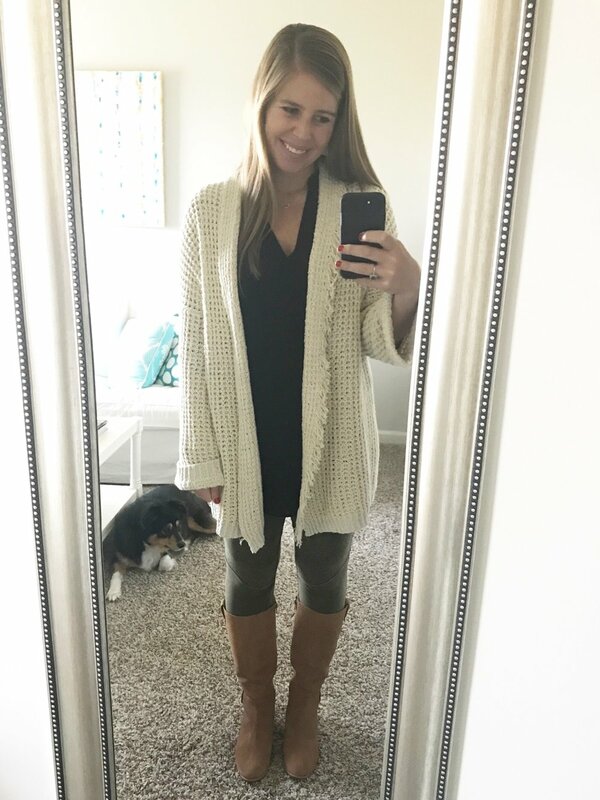 It is considered a tunic, but it is basically dress length and looks adorable with leggings and boots! The fun bell sleeves are my favorite part! Do you have any favorite Free People pieces? I don't think I can choose just one. Thanks so much for reading! I'll be back tomorrow with Part 2. Have a great day! Lilly Pulitzer is a brand that I have been wearing for years and years, so it only seemed right to add this post to my Brands I Love series. My mom started buying my sister and me Lilly shift dresses when we were young. However, at some point, maybe in middle school or high school, I started getting embarrassed to wear such vibrant patterns. I guess the opinions of other people made me second guess my love of this bright, happy brand. However, this phase didn't last long. I am a bright color lover, so it was only a matter of time before I stopped caring what others thought and decided to wear what I love! Plus, Lilly has more than just vibrant patterns. They also have solid colored clothing and tons of options for everyone! My mom and I are both wearing Lilly dresses in the photo above. Most of the Lilly clothing we own has been bought when it was highly discounted. They have two HUGE sales a year. These sales take place in August and January. The August one is coming soon, and I will have more information about it for you as we get closer to the sale. You do not want to miss it! Items are marked down like you wouldn't believe. Today, I'm going to share photos of the Lilly Pulitzer items that I own. Being from Mobile and close to the beach, I was under the impression everyone knew about Lilly. I wore a dress that was very obviously Lilly Pulitzer to school in Arkansas one day and was asked who made my dress. I couldn't believe people were unfamiliar with Lilly. So if you don't already know about Lilly, I am SO excited to share this brand with you. If you are familiar with it, I'm excited to share some of my favorite pieces with you! You can click on the blog category headings to be taken directly to the Lilly site. Also- just got this in my email! Be sure to use this code if you are ordering anything in the next couple of days! What do you think about Lilly Pulitzer? I am so excited about the sale coming up in August! I'm already searching the site trying to see which things I'm hoping will be included in the sale. Thanks so much for reading! 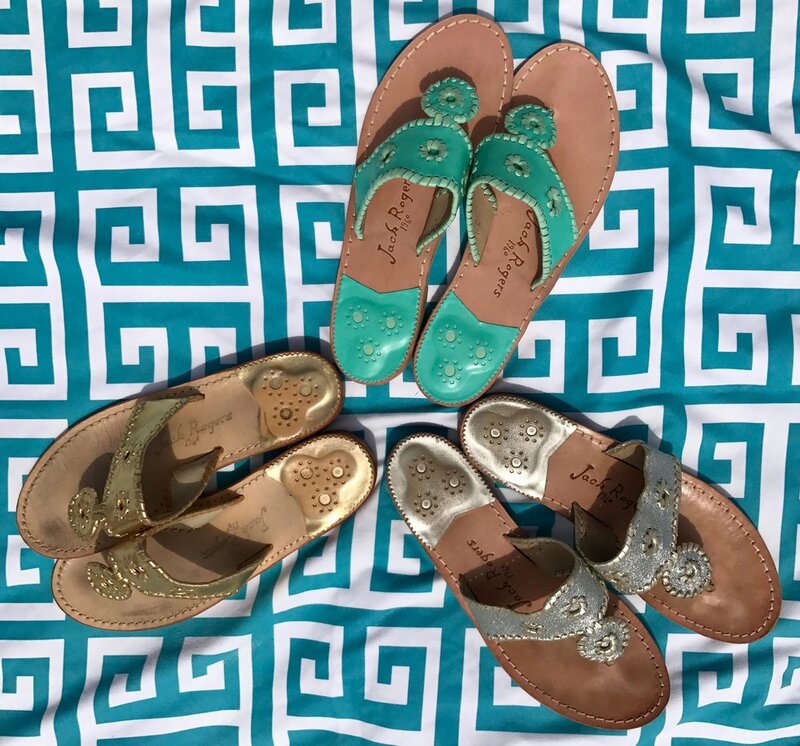 For my second post in the Brands I Love series, I am sharing all about Jack Rogers, my very favorite brand of shoes. Although I was a little late to the game in learning about Jack Rogers, once I discovered them, I never looked back. All credit for my love of this brand goes to my adorable roomie I had the privilege of living with when teaching in Huntsville. Molly gifted all of her bridesmaids a pair of Jack Rogers (among other generous things). Not only did our classic gold Jacks look fab with our comfy monogrammed sleep shirts she gave us, but they also paired beautifully with the black bridesmaid dresses we wore to her wedding. BEST GIFTS EVER. Thanks again to you Molly for introducing me to such a fabulous brand! On their website, Jack Rogers describes their products in this way- "They're the pieces that take you from an afternoon bike ride to evening cocktails and the ones you never forget to pack, wherever you're headed. A pop of color, an unexpected detail, a feeling of coming home...no matter where you are, that's Jack Rogers." If you have been following Art Fashion Fun, you have seen me wearing several different styles of Jack Rogers. And you also know that my number 1 favorite pair of shoes in the world is the Marbella Mid Wedge in platinum. I love them so much that I have two pairs of this exact shoe. They are a classic pair of shoes that completes so many different outfits. The color is perfect, and my other favorite part is the height. 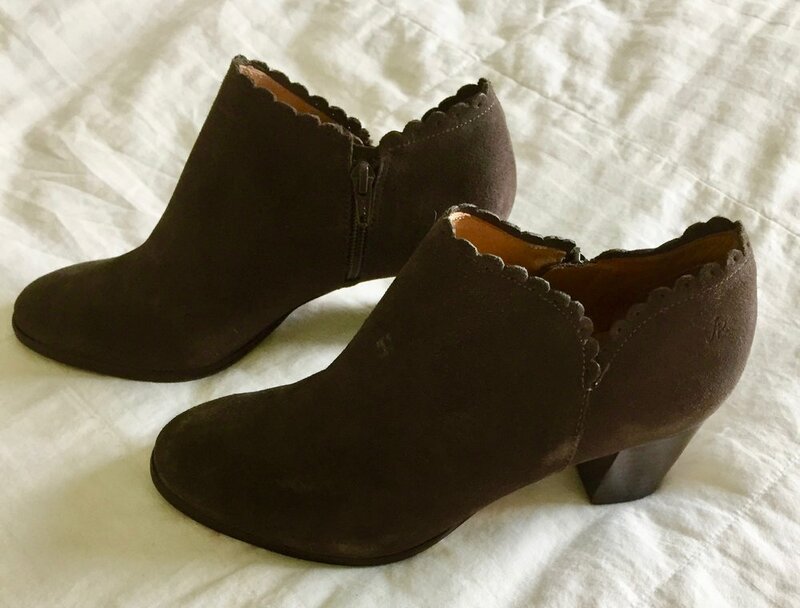 The 2.5 inch wedge heel makes them tall enough to give you a little lift, but low enough to make them a comfortable shoe to wear all day long. I actually choose to wear these over sandals that are completely flat when deciding on a shoe that I know I will be wearing all day long. I have found that the wedge gives your foot more support than a completely flat shoe. This offer expires at 11:59 tonight! I don't have a pair of jellies in this style and might just need to take them up on their offer! Do you have a favorite style? Or own any styles that I don't have and NEED?! I want to know! Thanks so much for reading!